Originally, they were going to ask Sarah, another girl from my gym, to fight. However, she’d been sick for that entire week, so she wasn’t up to it. Sarah’s at least 5kg heavier than me, and I was told that this girl would be, too. The size difference didn’t bother me, though. I’ve fought plenty of girls who were bigger than me. I had no reason to turn it down, since I was off work that day (something that often stops me from taking fights), so jumped at the chance. I usually won’t do any real sparring the day before a fight, just some light technique work with a trainer without shin pads on. This time, I really wanted to do some. I was excited at the prospect of a fight the next day and had too much energy to just shadowbox and hit the bag. Plus, I had a few things I wanted to work on after my last fight, so thought that a bit of sparring with those in mind would set me up nicely for the next day. Katy and I spent the morning working together, while I focused on a few specific points that I wanted to get right in this fight. Namely, following up after kicks, moving forward and using long knees. It was a good decision, because I left that training session feeling really sharp, which did a lot for my confidence. Speaking of confidence, this was something that I’d really been working on since my previous fight. I’ve always known that it was a weak spot for me, but wasn’t sure what steps to take in order to improve it. Just before this fight, I finally started working on it and was seeing real improvement. You can read more about exactly how I did that in my last post, ‘Letting Go but Staying in Control: How Mental Training Enhanced my Confidence‘. 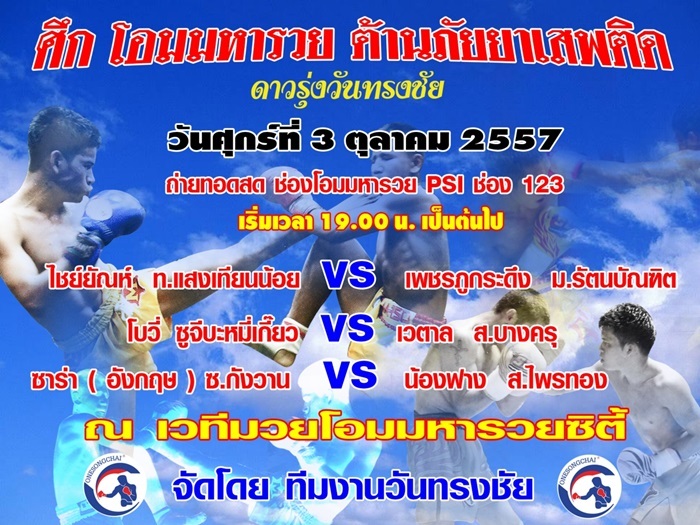 I don’t know that Thai fighter’s name, but the promoter told me that she was very strong and had over a hundred fights. She was in uniform with her hands wrapped, but didn’t seem to have an opponent, as there were only the three of us girls there. I thought that perhaps someone was to turn up for her later, but they must have pulled out because the matchmaker kept asking me if any of my female friends could come down and fight her. Katy and Sarah were on their way to watch me fight, but I didn’t fancy springing that on them when they got there. Although this fight came at short notice and included a couple of surprises — being on TV and a much bigger promotion than I’d expected —I felt incredibly calm and relaxed about it all. It was a televised show for a great promotion and for once, I didn’t have to rush. I could spend the whole night relaxing before I had to fight, and I did. We arrived at around 6:30, but my fight wasn’t until around 22:00. I lay down on a mat behind a curtain at the back of the ring, put my headphones in and just chilled for a while. I felt quite content in doing so. Everything seemed to be going my way, which is certainly not something I can usually say when I have a fight. I closed my eyes and went over some of my mental training exercises while everyone else from the gym went back to the other side of the building to watch the fights. A couple of young girls, maybe no older than fifteen, were sitting with my opponent’s group. They kept staring at me, giggling to each other and trying to take not so subtle photos of me while I wasn’t looking. They would also follow me whenever I went to the bathroom. I might have found that annoying at any other time, but on this occasion, I was too chilled to care. I figured that since I was just laying there by myself not doing much for most of the time, I would become less entertaining eventually. Later, Kru Singh returned and wrapped my hands before heading back out to watch more fights, so I resumed my position on the floor. The first four fights were mostly kids, after which the show started being televised. Before the second half of the show, there was a bizarre interval where a couple of presenters came on and cracked jokes while promoting the gold that was for sale at the venue. I could only hear it, since I was behind a curtain at the back, but it sounded rather odd. It seemed to go on for around fourty-five minutes, after which four more fights took place, mine being the last of them. 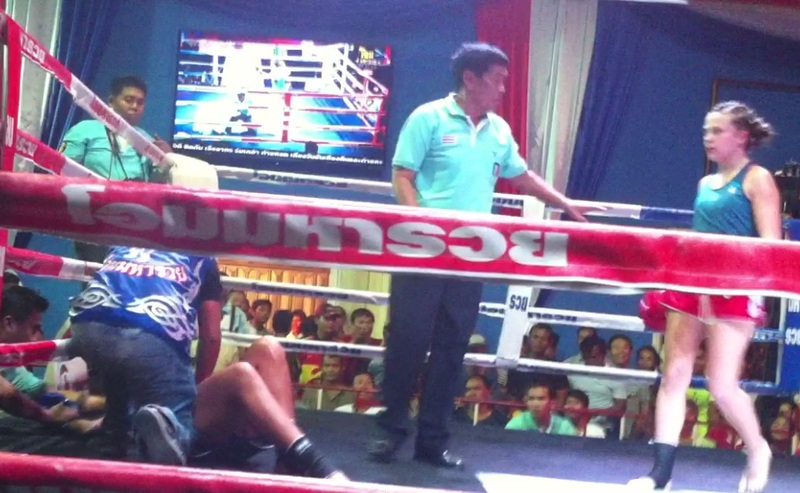 The Thai girl I mentioned earlier eventually took off her hand wraps and left — I guess no one showed up to fight her. After the first fight, everyone from the gym came around to the back for moral support while Kru Singh gave me a massage and I got myself warmed up. It felt great to be able to actually warm up for a fight, rather than arriving, wrapping my hands and going straight in as I often have to. Even better, Katy and Sarah turned up just in time, during the penultimate fight of the night. Here’s a short clip of me shadowboxing just before the fight, with my team-mates in the background. After that, we waited. Eventually, it was only us, my opponent and her trainer left. The room had emptied out as all the other fighters finished up and went home. The fight just before mine ended abruptly with a knock out in the second round, so the long wait was cut ever so slightly shorter right at the end. Below, you can see Kru Singh and I peering through the curtain at that fight, just before that happened. My team-mates backstage, just before my fight. When it was time to fight, everyone else scurried out to the front to get to my corner, while Kru Singh and I entered through the curtain which led up to a stage where some important-looking people were sitting (I say ‘important-looking’ solely because they were sitting on some fancy chairs in front of the ring). I greeted them before walking down the runway and sliding under the ropes. I felt ready. As I left my corner, I was reminded to ‘be first’, something that I failed to execute in my last fight but was determined to correct in this one. I wanted to assert my presence from the bell before she had a chance to get confident. I went straight in with a teep, to which she retaliated with flurries of swinging punches. Immediately, I could feel the weight difference between us. I chose not to engage with those flurries straight away and instead defended and stepped back. As she was coming in, her head was up, so I jammed the heel of my hand into her chin and pushed it back, before smirking at her to remind her that none of her punches had landed. She backed off for a moment and then came in with more of the same, so I countered with right kicks to the body, as her boxing stance made it more difficult for her to block them. The weight difference became more apparent as she pushed me back into the corner and threw a few repeated right kicks at me. She then went in for the clinch, but I moved out, not wanting to get in there with her straight away. A few seconds later, it was her in the corner, and I landed a few right hands on her before a knee to her body. She came back with more punches and tried to clinch, so I jammed my left hand into her face again, pushing it back before landing a right elbow onto it. It didn’t land quite as well as I wanted it to. It was more with the side of my elbow than the point of it, my hand was too far away from my body. Something to work on next time. I grabbed her and landed another knee before getting out. After that, I charged towards her. I fight much better going forwards than I do going backwards, and it showed. I could feel that it was almost the end of the first round and I knew that I could finish the fight there, so I went in with punch combinations, finishing every one with a right kick to the body, which landed every time in the same spot. On the third or fourth one, her body crumpled slightly and I followed with another right hand. She went down. As she did so, I instinctively threw another right kick, which landed on her face. At the time, I must not have registered that she was already on her way to the canvas. This isn’t the first time I’ve done this. The same happened in my fifth fight, which I also finished with a right hand. That time, the kick landed to her body. As with that fight, I didn’t know that I’d done it until after it was over, when my friends told me. The fight that we’d waited all night for ended up being over in just under two minutes. I was elated with the result, but Kru Singh didn’t seem to share the sentiment. Of course, he was happy, but he also seemed a little irritated, perhaps that I hadn’t fought the way he wanted me to. Before the fight, he’d told me to take it slowly in the first and second round and then turn it up in the third. It’s not uncommon for a Thai trainer to tell you to go in this way, and his reasoning for this was that ‘she big‘. I gathered from this that since she was heavier than me, the odds would be against me. Going in slowly at the start of the fight would have secured that, so if I had finished it in one of the later rounds, the stakes would have been better and he would have won some money. He also said ‘I want you to learn fight‘, by which he meant that he wanted me to take more from this one. Since it was less than two minutes long, I suppose I didn’t have much time to use it as a learning experience on the face of it. Still, from my point of view, I really had, and this fight was a victory in more ways than one. Firstly, I’d made leaps and bounds in my mental approach, which I believe set the scene for the entire night. I felt completely different going into this fight than I did for the previous one, so in my mind, I’d already won before I went in. This is something that I’ll be able to take into all of my future fights, as long as I keep using the methods correctly. 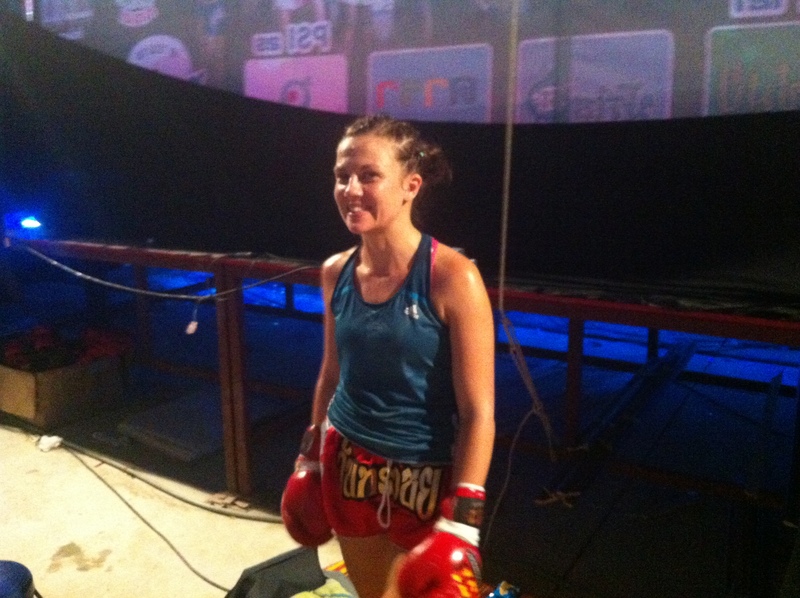 The end result of the fight felt like a bonus in comparison, but it was definitely good to get a first-round knockout. I’m really pleased with how this fight went. I think the below picture of me just before the fight sums up how I felt throughout the night – confident, calm and happy. Great job on the win. I love reading your fight blog and understanding the fighter’s mindset. Keep it up.